Read the September 2015 Facebook Fanpage trends report. , brought some significant changes in the rankings of the biggest British Facebook pages. The 2015 Rugby World Cup was gaining fans at a crazy pace, while Lewis Hamilton was beating the records in number of engaged users. What else happened on Facebook in the UK during the previous month? Read the second edition of the Fanpage Trends UK report prepared by Sotrender that summarizes various aspects of brands communication on Facebook! The Fanpage Trends UK report contains data on the number of fans, engagement, customer service and best content for 11 different industries present on Facebook in the UK. These are: All UK Brands, Alcohol, Banks, IT/Electronics, Beverages, Beer, Politics, Retail, Cars, Sweets, & Telecommunication. It turns out that the Queen doesn’t rule on Facebook in the UK. The biggest social network in the UK has many monarchs, because the biggest Facebook page is the England Football Team with almost 5,7m fans. 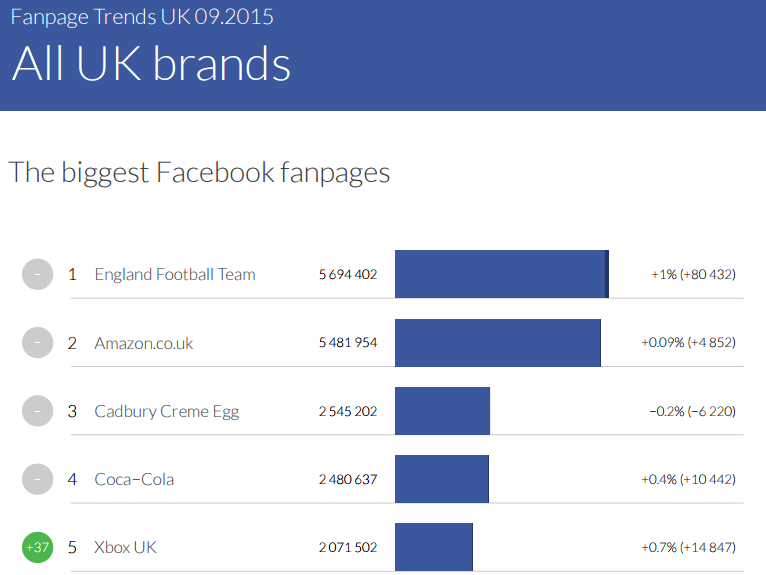 amazon.co.uk comes in second with almost 5,5m fans, while the Facebook page of Cadbury Creme Egg is third with 2,5m fans. We’re just past the midway point of the 2015 Rugby World Cup hosted in England. A huge interest from Britons in this sport can be seen also in the report. As a result the page of England Rugby is the second fastest growing page in the UK, as it gained over 100k new fans over the last month, and also the third most engaging page in the country with over 26% of engaged users. 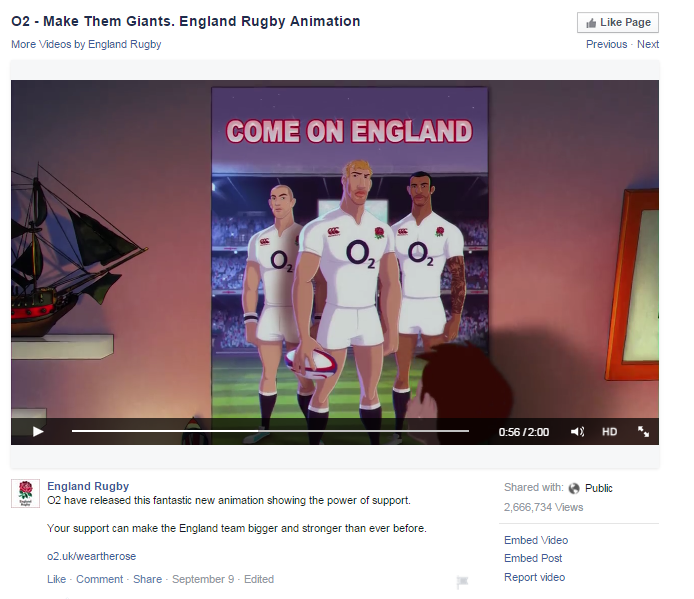 England Rugby is also the author of one of the most engaging posts of the month – their post from September 9th, in which they informed fans about a fantastic new animation showing the power of fan support, was the fourth best post in the UK in September. This is all despite the fact that the national team was under performing quite a bit this year.